Mag. Werner König - festungsverlag-salzburgs Webseite! 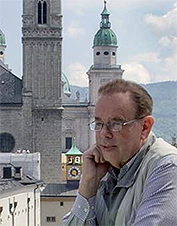 Werner König , a native-born Viennese, ended up in Salzburg in his early childhood. 1985 he took over the Salzburger Wochenspiegel as an Managing Editor and mostly worked as a journey and culture journalist. 2008 The Traumstrassen durch das “Stille Nacht” Land appeared under his name, which received a very positive reception in the press. The book is currently in its 6th edition. Marlene Shirley, born in the US-Virgin Islands, moved from Washington D.C to Saalfelden am Steinernen Meer, Austria at the age of seven. She finished her education in the Salzburger Festungsverlag, where she did editiorial and lay out design work on the Salzburger Wochenspiegel. She took over the editing of the programme of the Salzburger Wochenspiegel. After that she worked in Berlin, in film/and television as an assistant director. Apart of the usual publications, she followed the paths of Maria Franziska von Trapp into the "Pinzgau", where Maria and three of her siblings were born, and shows a small part of her second hometown in Austria.